Inclusive parking is at Britannia Country House or Britannia Airport Hotel - advised on arrival. If not using parking facility, hotel does provide taxi transfers (one way) from hotel to airport. 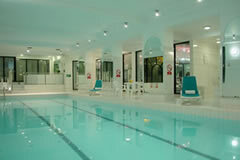 Leisure Club - £4.00 for an adult and £2.00 for a child. 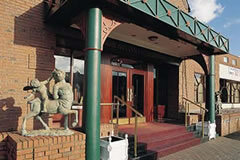 The Britannia Stockport hotel is situated in Stockport, 6 miles from the airport. Parking will be at the Britannia Airport hotel or the Britannia Country House Hotel. 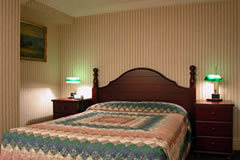 All rooms have en-suite bathroom, tea and coffee tray, TV, direct dial telephone, trouser press and hair dryer. Overnight parking is at Britannia Stockport and you will need to take your car to Britannia Country House to park on the morning of your flight. Transfers from the Country House Hotel are included free of charge to and from Manchester Airport.Transfers run 24 hours a day on a scheduled service approximately every 45 minutes. The exact times will be confirmed when you arrive at the hotel. 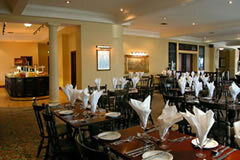 Parking is at the Britannia Country House Hotel, full details will be given on check in at hotel. 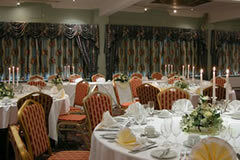 Transfers from the Country House Hotel are included free of charge to and from Manchester Airport. If not using parking facility, hotel does provide taxi transfers (one way) from hotel to airport. Transfers from the Country House Hotel are included free of charge to and from Manchester Airport. If not using parking facility, hotel does provide taxi transfers (one way) from hotel to airport. Hotel rooms look old and worn out. We had a problem with the shower. The manager changed the room straight away. Service was good. Transport to and from airport was very good. Well organised. I will recommend to my friends. Pleasant welcome and reception assistance. When we booked deal with parking showed photo of Brittania country house hotel which been to be fore so knew was acceptable . This hotel however was awful. Squeezed in the room. Carpet needed hoovering, bath , taps and toilet need replacing and not clean. All the silicone brown, black and grotty.Shower soap dispenser not been cleaned underneath for a long long time, filthy. Bathroom door grubby and sticky. Checked bed sheets and looked clean, bed was fairly hard but fine for us. We did eventually get few hours sleep. Did feel misled and driving round Manchester to Brittanias country hotel to park wasnât expected and certainly will check info better next time and wouldnât stay here again! The hotel and breakfast where both fine and ok . But the free up to 15 days parking was a really poor service. The car park is not secure and the instructions and service from reception at the sister hotel where you park the car are no-existent. We were just hand 2 vouchers which both stated hotel- to -airport tax. The taxi driver ( once we found him) took both of these off us on the way to the airport. On our return from the airport and ringing the number provide. The taxi company would not pick us up without the voucher reference number which we did not have or pay Â£12. After 4 different calls to Britannia no one could provide or find any information on our booking!! Therefore we had to pay for a taxi. Additionally even though our car was parked on there premises they could not find any reference for the booking. how they know your car is parked within there premises is beyond me and we felt conned on our return from holida! Everything that could be done wrong probably was in case of this Park+Fly event with Britannia hotel. 1. On arrival I've found out that the next day before my early morning flight I will have to leave the hotel and drive to a different one to leave the car there and get my transfer to the airport. Quite a surprise considering the whole point of Park+Fly is convenience and saving time. I had to get up more than an hour earlier because of this (which is a lot when one flies at 6am). 2. The hotel felt worn and unhygienic. There were pieces of used linen, cloths and mops in corridors lying around. The smell was very unpleasant. 3. The receptionist at that other hotel was totally unaware what's going on when it comes to transfers. And not very much willing to talk to customers either. 4. Our taxi was half an hour late! Despite us being there much earlier and telling the reception we are on a rather tight schedule. 5. Return trip was not better organized either. At the airport I had to walk from one taxi to another telling them my name, rather frantic procedure at a busy, noisy and polluted with car exhausts place. That transfer (back to the hotel) was half an hour late, too. My opinion: Avoid, avoid, avoid! The Britannia hotel we stayed over night in, was in fact a nice hotel with a good bar and food, the room and bed was comfortable, however the night manager told us we would have to leave the hotel at 7am in the morning in order to get to the Britannia Country park hotel where we were parking the car, we left actually at 6.55am to give us extra time but this was not enough as we missed our transfer to the airport and had to have a taxi from the hotel to the airport as we could not wait for the next transfer bus, I think the manager should have told us to leave at probably 6.30 - 6.45am, this info needs to passed on to prevent other guests having the same problems and extra costs. One more point was in the hotel we stayed in over night there were employees in the bar that were obviously drunk as they were swearing and shouting loud, even though the bar manager told him to stop, we found this a little off putting for future bookings here. I did not like driving from one hotel to another this I would not do again once my car is parked I do not want to have to drive it until I come back off holiday. Terrible, will not be booking with you again the pick up to airport didn't turn up twice went into hotel to get transport sent we were not the only people standing waiting. On way home called for our pick up we were sent to wrong place to wait from your office & we had to wait 40 minutes after we called. Very poor service. Excellent place to stay, perfect host. Felt very relaxed in the property. The hotel was of poor standard, although the bedding was clean. The room which was small was on the ground floor, whilst every movement and word spoken in the room above could be heard, causing a disrupted nights sleep. The faculties were poor. We booked the hotel for airport parking too, but only found out the car park was at an entirely different location to the Hotel in a different part of Stockport, about 30 minutes away. The parking was ok, but we were then told by the shuttle bus driver that a taxi would collect us from the airport on our return. Needless to say we waited almost an hour for the taxi to arrive at the airport after being told it would arrive within 25 minutes. 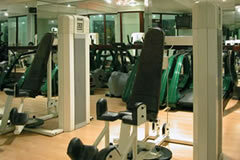 All in all the hotel premises and experience was so poor I would not recommend it to anyone. On the plus side the young man at the reception desk was very pleasant and helpful. A very outdated hotel. Not up to standard expected of an airport hotel. Could not get a chocolate drink as the machine had run out and no attempt was made to rectify this when asked. Will not return here. Nice hotel with small but clean rooms. Shower control came off the wall in my hand when turning it off so needs updating/fixing. Airport parking is at a different hotel which we had to drive to in the morning. About 20 mins with no traffic. Had to wait 35-40 for the transfer back to our car at the Britannia Country House hotel. It was a private taxi both ways which was good. My car battery was flat on our return but the hotel maintenance staff jump started it for us and very really quick to come to my car. Not even worthy of one star! Rude and surly staff at check in. Tired room that was too small for three people let alone providing beds for four! Bed sheets old and washed so many times they were transparent. 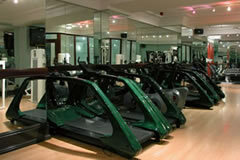 Car parking booked for the week also but on arrival were informed that parking was at sister hotel a 30 min drive away. Not informed by check in staff that we were booked on a transfer the following morning, consequently we were late checking in for our flight. the hotel was ok but the time to travel to a sister hotel for parking was far too long, almost 30 mins. I don't think we would have found it without sat nav and when we got there the car park was virtually full. At 3.00 in the morning it is hastle you can do without. I would not use again and suggest that you try somewhere else. You pay for what you get. Great price for 1 night's accom plus 14 days parking. Accom v tatty but a place to sleep. The 40 min wait to get picked up from airport not great and the car utterly filthy from the trees. But would use again. Found it easily enough, the hotel is budget and most of the guests seemed to be on coach tours or airport bound but the hotel is very clean, good beds and happy hour (and a quarter) at the bar, though the bar only opens at 5.30. I can't comment on the food as we ate earlier in the day at a local pub and left too early for breakfast in the morning. Just a litte bit complicated, stayed at the hotel for the night,then had to move to another hotel, parked for the 7 day duration.A little bit unclear about the pick up for the airport, unsure what to do on the return from holiday, eg it just states ring office number with code,does not let you know what or where the phone is? then the pick up name was not listed on the taxi collection, but all was good and inexpensive. From East: Leave M60 at J.27, Stockport East. Take 4th exit, Buxton. Go through traffic lights, stay in outside lane to lights at top, go straight through lights approx. 1/2 mile, through crossing lights. At next set of lights, turn left and follow Hempshaw Lane for approx. 1 mile to next lights. Turn right into Dialstone Lane and hotel is about 150 yards on left. *********From A6 Manchester: Follow A6 to Stockport. Go through town centre, follow A6 along main road, past town hall and college until you reach traffic lights by Bamford Arms. Turn left onto Nangreave Road and follow it until you reach traffic lights and turn left into Dialstone Lane. The hotel is approx. 50 yds on the right. *********From A6 Buxton: Through Hazel Grove, carry on through 1st set of lights. At next lights bear right onto Dialstone Lane and follow for 1.5 miles and you will see hotel on right. with the airport transfers, is it drop off and pick up? Thank you for your email, Transfers from the Country House Hotel are included free of charge to and from Manchester Airport. If not using parking facility, hotel does provide taxi transfers (one way) from hotel to airport. How far is it from Brittannia Stockport to Country House Hotel. If I was booking this we are staying at hotel on return then travelling home. Would we get a free transfer to airport and transfer to stayover then to collect car next day?The Country House is 20 minutes away from the Stockport. On your return you will get a free transfer back to the Country House to collect your car then drive to to stockport for your overnight stay.